Bohemian chandeliers light up, with their crystal glitter, the palaces of Heads of State, parliaments, government residences, concert halls, theatres, hotels and places of worship around the world. Their timeless aesthetic value is based on the purposefully evolved chandelier-making tradition in the Kamenicky Senov region, dating back to the year 1724. 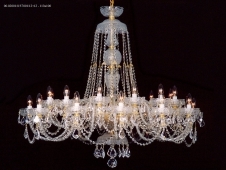 Crystal chandeliers in this line are decorated with traditional cut called 500 PK or 57001, which is the all-time bestseller. All chandeliers are available in Nickel and Brass execution.